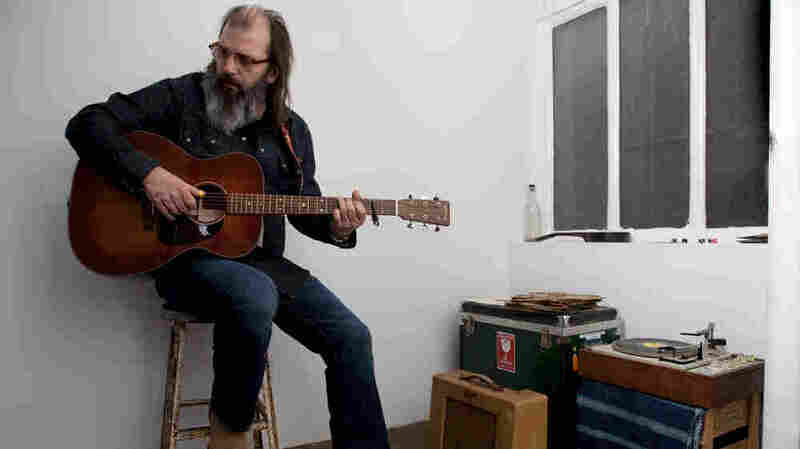 Steve Earle On World Cafe : World Cafe The rough-hewn country singer is back with a new album and a book. Listen to Earle play live in the WXPN studio and chat with World Cafe host David Dye. Steve Earle performed on World Cafe. For more than three decades, Steve Earle has helped define modern country music. At the dawn of his career, Earle helped bring about the term "new country," and has been relentlessly touring and recording ever since. His career began in meager fashion. Earning a living as a songwriter, his songs were recorded by some of the big names of the 1970s, including Carl Perkins and Vince Gill. Earle would have to wait until 1986 before his own album saw the light of day, but it proved to be worth the wait. Guitar Town shot to the top of the country charts and was certified gold, earning two Grammys along the way. Despite battling addiction in the 1990s during what is famously known as his "vacation in the ghetto," Earle cleaned up and started writing again, opening a fresh new chapter to his life. Since then, Earle has drawn from diverse styles of music, including bluegrass and hard rock. After his Grammy-winning 2009 release Townes, which featured Tom Morello, Earle's wife Allison Moorer, and his son Justin Townes Earle, he turned to his latest effort, I'll Never Get Out of This World Alive. Released this past April, the album was featured here as a First Listen and gave thousands an early glance at an album packed with years of wisdom and honesty.